This weeks challenge again comes from Jane Eborall. This week, we are highlighting her annual TAIS challenge. A TAIS is a tatting pattern that is given out piece by piece, leaving the final motif a secret until the end. Currently, the 2014 TAIS is on day 4, so it is a perfect time to join in. Most days take less than 30 minutes, and people post photos of there work as they go, so you never really get to far off. Part of the fun is also trying to guess what you are making. Some of the guesses I have seen include a nativity, a sail boat, a bonnet and a garden archway. 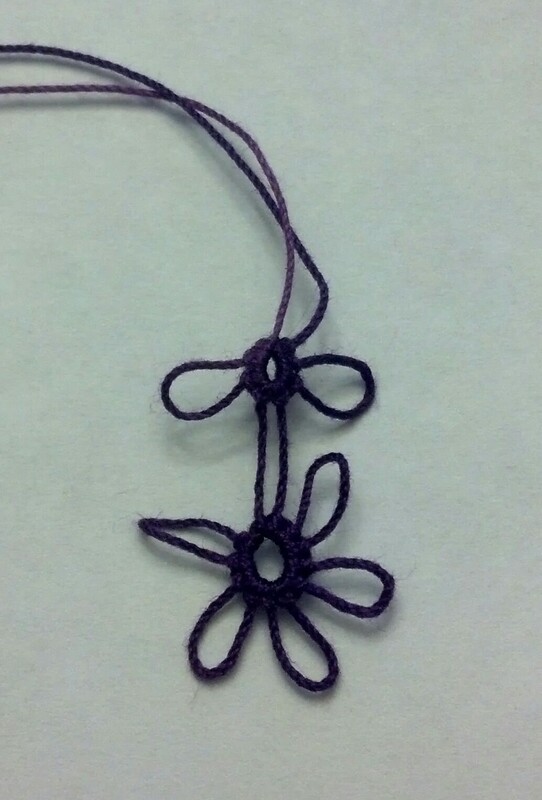 It is amazing how tatting brains work, isn’t it. So, join in the fun. 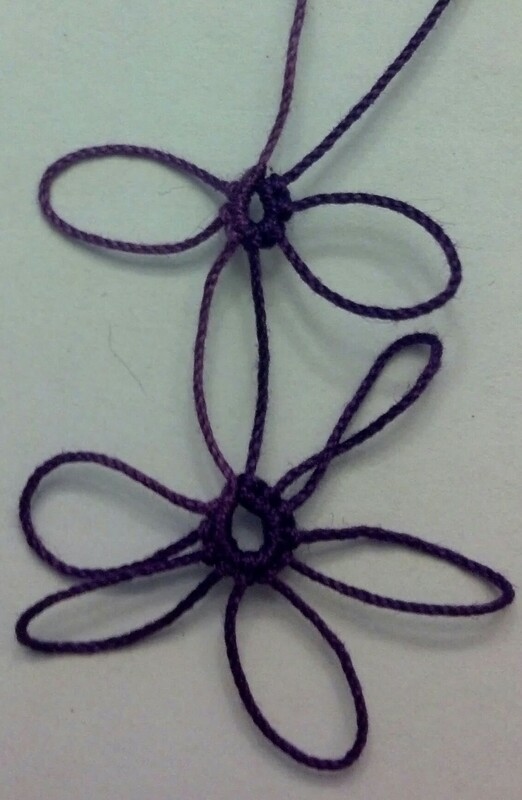 For me, this is a great way to get back to tatting after the holiday rush. share your pictures with us and with Jane. Details to follow but you can check it put here. So between vacation, fighting a cold, work, the weekly challenge, and Fall Lace Day – it took me a while to catch up on the TIAS. However, I am finally caught up. I completed days two through seven yesterday. I hope to stay caught up now as well. I really have no idea what it is going to be. Sherry Pence’s TIAS – Day Two – Tatted by Natalie Rogers. Sherry Pence’s TIAS – Day Three – Tatted by Natalie Rogers. Sherry Pence’s TIAS – Day Four – Tatted by Natalie Rogers. Sherry Pence’s TIAS – Day Five – Tatted by Natalie Rogers. Sherry Pence’s TIAS – Day Six – Tatted by Natalie Rogers. Sherry Pence’s TIAS – Day Seven – Tatted by Natalie Rogers. I’m loving the mystery. 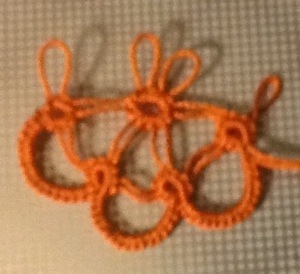 It’s exciting tatting a few bits at a time and wondering what it is we are making. Are you participating in the TIAS? Do you think you know what it is? Leave a comment and let me know. I am enjoying this TIAS. I got the the great fun of doing the first part twice. I went to work the first ring on the second day and my thread started unraveling. Anyways, I am hoping it is a pony and this is the seat part of the saddle. I hope everyone is looking forward to Sherry Pence’s Fall TIAS! Tomorrow is the first day. I’ve got my shuttles ready to go and I hope you do too! Make sure you have your two shuttles continuously wound with size 20 thread of any color (solid of variegated). 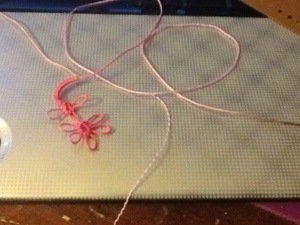 She also recommends a picot gauge of 1/2 inch or 1 centimeter. This is going to be fun! Having a hard time waiting for Jane Eborall’s next TIAS in January? Well, wait no longer. Sherry Pence has jumped in and is offering to do a Tat It and See starting on September 23. She has an award winning pattern all set up to give us in small pieces. She even plans on giving those who finish the TIAS a bonus pattern. I am looking forward to slowly unraveling the mystery of this pattern as we work through it. This will be the first TIAS I’ve participated in (I found out about the one earlier this year via a completed TIAS project). I hope that you are up to the challenge as well! If you wish to share your TIAS progress on the community blog, please sign up here (you will need to email Sherry Pence). You are do not have to sign up in order to participate, the community blog is just as easy way to show off your progress. I plan on charting my progress (and hopefully that of a few of the Shuttlebirds Guild members here). I’d love to see your progress as well! To be able to post your pictures to the community blog you will need to email Sherry Pence (LadyShuttleMaker (at) Hotmail (dot) Com). She will then add you as a blog author and you will be able to create posts showing your progress. Everyone is welcome to participate in the challenge and I will happily help fellow participants get their pictures displayed. If any one has questions about posting to a blog, please feel free to ask them.